The building isn't in the brand new, growing suburburban business zone with plenty of land and vast parking lots; it's in the heart of the metropolitan area. 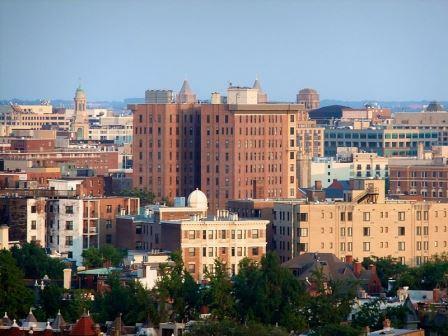 The building is a mainstay in this town, and is firmly entrenched in the business landscape. A building like this could be anything: an office space or maybe a dormatory complex for the university. But this building in particular, in all its 1970s splendor, is a hospital, full of patient rooms, operating rooms, labs and ICU wings. Now, deep inside of this building, among the thousands of workers, administrators, patients and visitors going about their mission critical, life-saving work, lie some of the nastiest, dirtiest air handlers you've ever seen. The maintenance crews work hard at keeping them running. Fan motors have been replaced two or three times and it's probably had a coil replaced at least once. If it's a steel unit, especially if it's a steel unit, the base is rusty and falling apart in places. A few of the units have been replaced, where possible. Many of the units have been rebuilt in places; shiny patches of sheetmetal contrasting the aged look of 40 year old steel. The mechanical supervisor is happy with how the units have lasted, despite their cosmetic, and sometimes operational challenges. But he is alone in his admiration. AHU-17 is of particular interest to the facility. It's an original air handler of unknown origin; it's brand name plackard having long since fallen off. Beside the normal coil and fan replacements over the years, 'ol 17 has seen better days. Its dull exterior is pock-marked by unsealed probe holes and random duct tape bandages sealing who-knows-what. You wonder if the duct tape keeps untreated air out of the unit, or if its true purpose is to keep something trapped inside this 40 year old beast, else it might give up the ghost and stop running. The facilities department fields work orders for unit 17 ranging from "my office/lab/operating room is too hot" to "the air conditioner was so loud it scared my patient and they had to be sedated!" 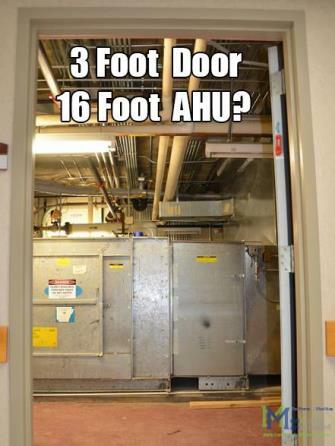 Something must be done about AHU-17! Obviously, something must be done about AHU-17! Back in the facilities meeting, one of the project managers spoke up and stated the obvious "We need to replace AHU-17." Most everyone nodded or humphed in agreement. The head mechanical supervisor, James, having spent most of his career working at the facility, responded "There's no way to replace it. It's up on floor 12, in the middle of the ICU wing. Have you seen the mechanical room up there? The door can't be more than 3 feet wide, and the service elevator is at the far side of the hospital. No, the problem is the fan, I can change out the return fan and quiet down the air intake." This seemed like the logical solution. After all, it's what they had done to "fix" the unit before: Patch this, change out that, buy another roll of duct tape. Most everyone nodded or humphed in agreement. But Monday morning, in that meeting, where it seemed the only thing running out faster than the patience was the hot coffee, something was different. Maybe it was the absurdity of the parking deck incident (the driver's conscious eventually won out and she reported the incident to the front desk), or maybe someone in that room had been reading the blogs on MonMan.com and knew how to handle a difficult air handler replacement, but one brave soul spoke up. "Maybe we can replace AHU-17; how old is it?" asked the new Energy Specialist, Ben. "It's oooooold," said the gruff supervisor, "but there's no way to get a new unit in there." "We could replace the air handler if we built the new one on site." "I still don't think there's enough space for a site built unit." "Not a site built unit... a SiteBilt unit. From Air Enterprises," replied Ben. "Look, the unit has been here since the beginning; it's old." Ben cut himself off when he realized James had been there since the beginning, too. The supervisor looked up for a moment. Ben was wondering if he would take that as an insult, but James' mouth curled up at the corners in a wry, proud smile. "Why yes, it is. And it's the best one we've got!" Relieved, Ben continued, "I'm sure the loud fan isn't the only issue we have with AHU-17." He flipped through his papers and found a recent energy analysis of the mechanical system. "It shows here that we likely have over a 15% air loss through the unit. That's a huge efficiency problem. I can use that to get the new unit approved by the guys upstairs." "We can tear out the old unit and move the patients to the East wing. We can use an Air Enterprises SiteBilt unit that can be built inside of the mechanical room. They guarantee their unit for 40 years and the low air leakage rate, too!" James, the supervisor, sat there considering. "Well," he said, "17's base did rust out about 10 years ago and we've reinforced the walls to account for bigger fans we put in 5 years ago." "Perfect!," exclaimed Ben. "Think of how much of an improvement we would have...the patients would have...with a new unit. The base of the new unit is guaranteed rust-free for 40 years because it's all-aluminum." While this brainstorming was going on, the coffee had run out, and the rest of those sitting around the table, unable to pass up the chance to have a real conversation that didn't include sedated patients or angry badgers, sat up in their chairs. One project manager interrupted when he asked "Hey, don't we have an Air Enterprises unit up on 15?" "Yeah, we have a few of them," replied James. "Now that you mention it, I had forgot they were there. Hmmm. I guess we don't get any complaints from 'em." "So, Ben," asked the nursing department manager, whose interest had been piqued, "Just how long will this new unit take to build?" The thought of moving patients to the other wing didn't sound like a good idea. "Well, building the unit is the easy part. Testing the new unit and cleaning up the room usually takes longer. You should check out a video of it online and see the whole thing. Better yet, I can give Rita at MonMan a call after the meeting. She can do a site visit and provide a budget price. I worked with her a few years ago at my previous job, and the project went great. The amount of time your patients will be relocated depends on a lot of factors, but I'd say we could get it all done in under a week!"